Vancouver has some of the most amazing cherry blossoms in the world at Springtime. 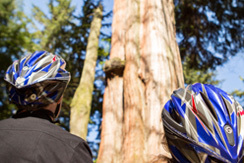 Combine the gorgeous scenery with a couple other classic Vancouver attractions and you have a perfect day spent in the sun. As you bike up to the Mount Pleasant area, there will be some short hills. But don’t let that stop you! 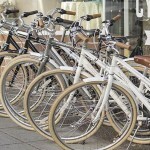 Simply walk your bike if you ever feel the need. What a celebration of life it is, cycling through canopies of pink blossoms. This route has a lot of zig zagging through East Van, you don’t have to follow it metre for metre, but just to give you an idea of the safe streets, and the biggest trees. Union Street– After you cross main, there is a city block with a separated bike lane with tons of friendly food spots. Union Street Cafe or The Tuck Shoppe are a few great spots on Union Street. On East Georgia, a good local hang is the Cafe Brixton. This area of Downtown Vancouver is called Chinatown, and the Downtown East Side. Despite it’s looks, it’s has some great restaurants. Bomber Brewing – A staple for us at Cycle City Tours, Bomber has tons of springtime seasonal beers to try. Through the blossoms! – East Van is where the blossoms are at! 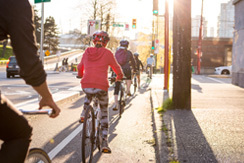 Through this route are some of Vancouver’s most beautiful streets. Dude Chilling Park– A community hub for outdoor hanging. Toss a frisbee, have a beverage and laugh at the sign. The Wallflower – This restaurant is a great spot for dietary restrictions. It’s rare to eat at a place that caters to meat eaters and gluten-free diners equally. The namesake fits right in with this tour’s theme as well. In Bloom: An Ode to Vancouver Mural- A new mural in the Vancouver Public Art collection artist Ilya Viryachev worked with youth from a local community centre to realize this large piece of art. 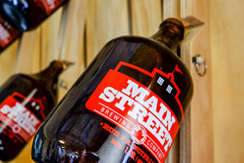 It lies in an alleyway west of Main Street and 8th Avenue. 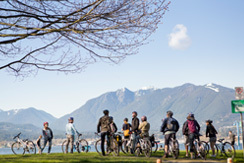 Charleson Park – Take in a great view of the Vancouver skyline at this popular park. 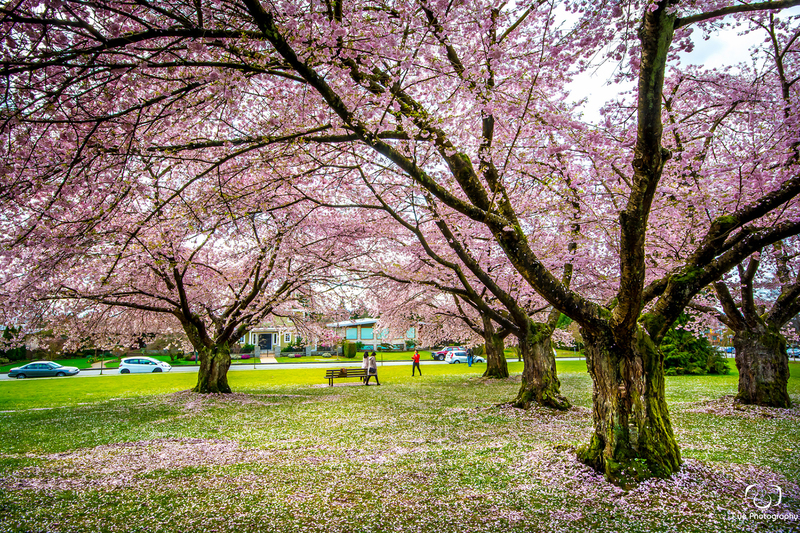 Vanier Park – This park has some great blossoms, and beautiful green grass to laze about on. Or bike right by and head to the bridge. Burrard Bridge – A final great view point before heading back to the shop, Burrard bridge was completed in 1932 making it a Vancouver Heritage site. These spots are marked on the map, but are up hills and a little far to get to by bike. That said, it is definitely not impossible! So swing up to some of these spots to further immerse yourself in the wonderful season that is Spring. Some day this is the season that Vancouver looks best in. These destinations are also marked on the map above. Nelson Street – Two blocks of gorgeous cherry blossoms, heritage homes and a park, you can’t go wrong. Burrard Skytrain Station– All visitors to Vancouver will encounter this Skytrain stop at one point. The blossoms surrounding the area are worth a second look. Fairview – On 7th Avenue between Heather and Hemlock is a gorgeous spot for blossoms. This is easily accessible from the regular route, however it is up a hill which is why it didn’t make the cut. W 16th Ave – Between Granville Street and Maple. 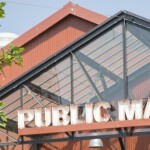 This is a great spot for a walk through the trees, and to check out the South Granville shopping district. W 22nd Ave– Between Arbutus and Carnavon Street. Queen Elizabeth Park– Take in this gorgeous park, with great views and beautiful blossoms. 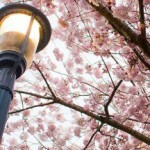 Vancouver Cherry Blossom Festival – Are you in Vancouver March 24-April 17th or anytime in between? Take the time to go celebrate with some of Vancouver’s biggest Cherry Blossom fans! They host tons of events, performances and activities – including a “Bike the Blossoms” group ride!